Now, Denver has yet to do the juicy lucy (it’s got an “i” when I’m writing about the genre of burger, I decided, so there). 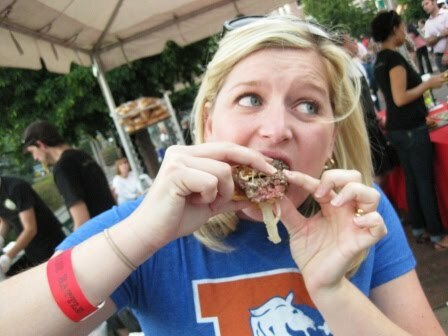 But much has to be said for the competitors that warm Colorado evening at the Denver Burger Battle. It was an occasion pitting 10 restaurants against one another vying for the grand prize at this1st annual event: pride and notoriety as the judge’s choice. 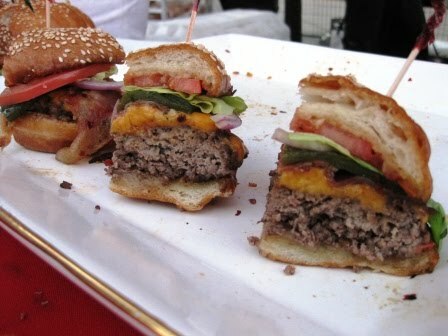 Of the many grills and flat tops, I favored Deluxe Burger and Steuben’s. 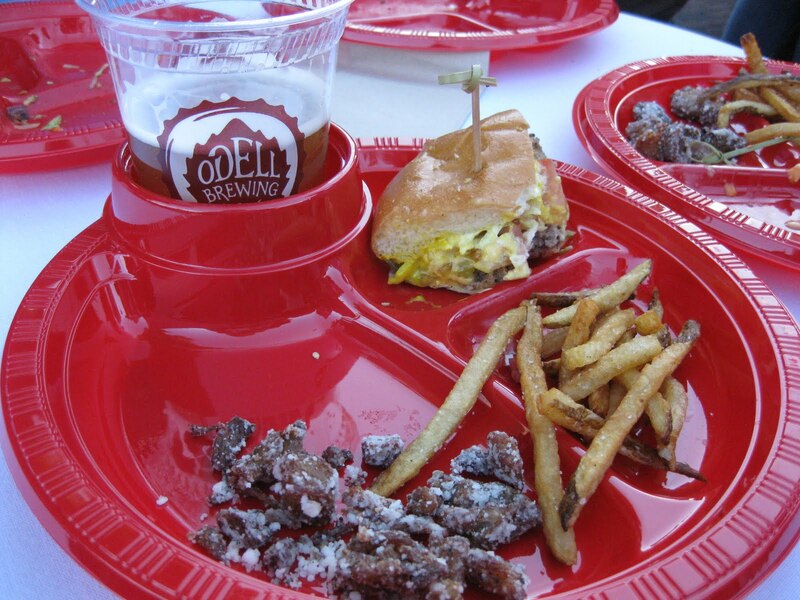 Neither of which received the judge’s nods nor “People’s Choice.” Both burgers were wet with beef juice, covered in item after item of toppings and came with accompaniments. Deluxe used buns from a local bakery, 100-percent Angus beef, Port reduction, balsamic onions, aged Stilton and roasted garlic aioli. Steuben’s “Green Chili Cheeseburger” with Udi’s Challah Bun, RiverRanch Beef, Don Rickle’s Secret Spice Rub and green chili. What’s cool is that both had fresh, four-wheel kitchens with cool pop-art colors and real food comin’ out of them. 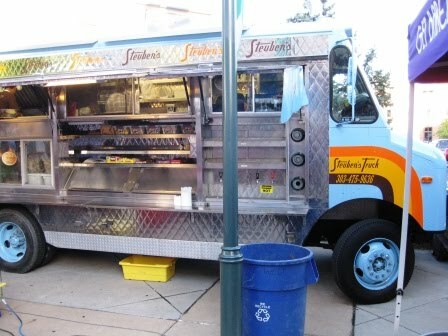 It’s an up-and-coming trend nationwide, food trucks taking to the streets to feed the premier palates of we, the people. What I loved about these two booths at the Denver Burger Battle was their offering the burger’s trusty companion: french fries. Deluxe’s pile of potatoes grabbed me at first sniff…garlic! Yes! I came back for thirds, and that says a lot in midst of a 2.5 burger consumption and 2.5 beer evening. You could tell there were some geniuses behind the driver’s wheel that evening! Another impressively innovative part to the night was the plastic plates with a cup holder. Wow, smart-thinking! Now where can I get em for my next BBQ? Thanks for the post about our event! Glad you could come and give your thoughts on the night. 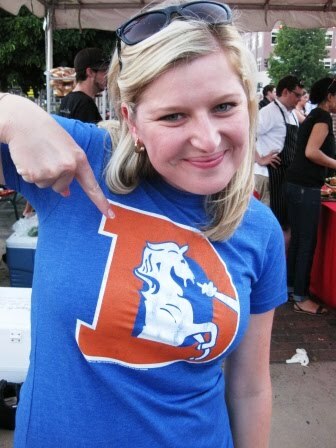 And always happy to see someone repping the Broncos the way us good Denverites should on a hot summer day. 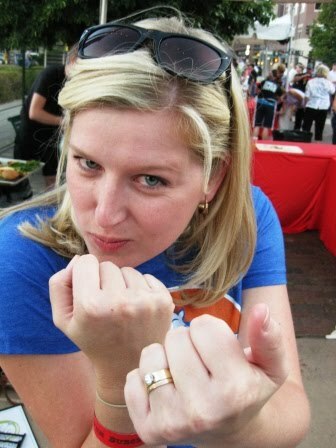 Planning for the 2011 battle is underway – if you want to shoot me an email, I’ll give you an alert for when discounted tickets go on sale.